June 1, 2016 – Employers must be fully compliant, having made any necessary updates to workplace hazcom plans and workplace container labels. The state plan follows very nearly OSHA’s HazCom revision, however, its date for training employees on label elements (June 1, 2014) is six months later than the federal deadline (Dec. 1, 2013). Those on the sidelines are watching to see if Federal OSHA will reign in Washington in on that point. Even if it did, given the pace of regulatory maneuvering, one has to wonder if any legal challenges would stretch out beyond either deadline, thus making the entire matter moot from an employee training perspective. OSHA published a new Letter of Interpretation for the Hazard Communication Standard, its first addressing HazCom 2012 related changes. Dated March 25, 2013, the letter is in response to questions about the proper way to address combustible dust hazards on labels and safety data sheets, particularly for those materials that do not pose a combustible hazard in their shipping form, but may present a hazard in processing downstream. 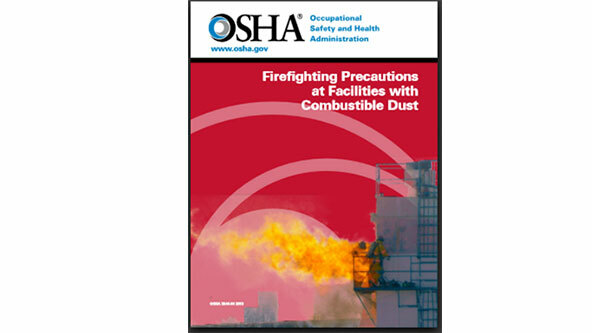 In related news, on April 1, 2013, OSHA issued a 30 page guide aimed at first responders on how to deal with combustible dust fires entitled Firefighting Precautions at Facilities with Combustible Dust. The guide is an interesting look at OSHA’s perspective on combustible dust and is something any facility with combustible dust will want to look at.